RE: COMPLAIN ON INEFFICIENT SERVICES ON –BY REGISTERED NO. 0723 776400. I write to register my complain on your Mpesa services as detailed below arising by sending money to a wrong number. 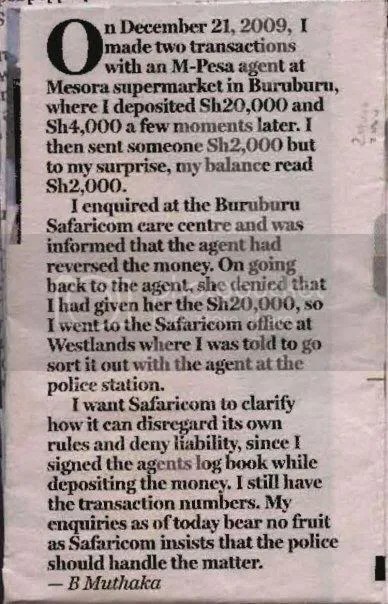 I sent the money to telephone number 0722744629 registered name John Wakathare instead of 0722744623. Immediately I realized the error, I made several calls lasting over 10 minutes to cancel the transaction . The Mpesa customer care attendants were all engaged and I wouldn’t be attended from 5:40:25 to 5:50:00 by which time the receiver had enough time to withdraw the money before the reversal was done. I MADE FOLLOWING CALLS WHICH WERE PUT ON HOLD AND DISCONNECTED. I sincerely and honestly think your services are deteriorating and something has to be done sustain your super good image in the industry. The issue may not be the amount sent to a wrong number, but the attention from the service provider. As a matter of concern. this 0724 738068 number is being used in fraud.Safaricom please track its activities. I bought airtime of Kshs 700.00 on 20/06/2016 after which I was advised of balance of Kshs 4,369.15. Previous balance being Kshs 5,480.15 means charge of Kshs 411.00 for buying airtime!! Safaricom has proved to be the best even though when a problem occurs they keep you waiting. I was assured that I will get back my money in 72hrs time after I missed a number and sent money to a wrong TILL NUMBER. Immediately I raised the complain and I was assured that of my money, it was on 13th this month and up to now its 6days still counting, the reversal I was told was successful so am wondering 72hrs to 6days do I still stand a chance to get my money?